If you’ve been drinking Martinis for any length of time, you’ve likely heard of movie director Alfred Hitchcock’s famous disregard for vermouth. According to the tales, the closest Hitch would come to a bottle of vermouth is to glance toward it from across the room, then toss back his “Hitchcock Martini”—nothing but a chilled glass of gin. It’s the stuff of legend, possibly even true, and sums up vermouth’s fall from grace during the last half of the twentieth century. And it wasn’t just Hitchcock. Winston Churchill had a similar schtick. In fact, it seems that by the end of the 1950s, everyone disregarded vermouth. American vermouth manufacturers closed up shop, and European producers sent only their simplest, dumbed-down products to the US. Decent vermouth, the stuff you can actually drink, pretty much disappeared from the American marketplace. As for the poor, dry Martini, “dry” lost its original meaning of “not sweet;” in common usage, “dry” became shorthand for “with as little vermouth as is humanly possible.” It was the heyday of those little vermouth atomizers. Many bars abandoned vermouth altogether, Hitchcock-style. Vermouth turned to vinegar on back-bars everywhere. That started to change around 2000, as the rise of cocktail culture reignited an interest in old-school cocktailing, Along the way, American vintners found a renewed interest in vermouth, and European producers started sending high-quality products to the US again. And finally, cocktail lovers like me discovered that there really is such a thing as a good, vermouth-based cocktail. Who knew? My favorite example is the Pantomime Cocktail. Light, small, and low in alcohol, the Pantomime is an excellent example of early twentieth century cocktail design. More elaborate (and more fun) than a simple glass of vermouth, and less urbane than the original, vermouth-dominant Martini, the Pantomime is an excellent small aperitif, or a “shim” to spread out stronger cocktails. I was reminded of the Pantomime by Dinah Sanders’ The Art of the Shim , a delightful collection of low-alcohol cocktails both new and classic. 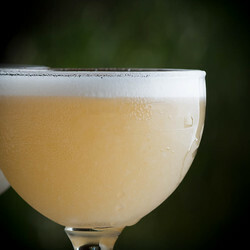 As for origins, the drink itself seems to be a Harry Craddock original, first published in his 1930 Savoy Cocktail Book . Dry shake (no ice) all ingredients for a few seconds to start the egg white froth; add ice, and shake until well chilled, and the egg is well foamed. Strain into a small, chilled glass. Optionally, garnish with a bit of grated nutmeg. There is quite a variation in flavor in modern vermouths, so you may enjoy some experimentation to find the one that best suits your tastes. I have experimented with Imbue’s Bittersweet, Dolin’s Dry, and M&R’s Dry. Dolin and Imbue lean more to fruity flavors; the M&R emphasizes herbs and spices, and is a little less sweet. The Pantomime is somewhere in the middle of the cocktail sweetness spectrum, as you might expect of a shot of vermouth with two kinds of syrups, but the egg white foam, in addition lo looking great and adding a very pleasant mouthfeel, mitigates the sense of sweetness from the syrups, and seems to help tie the drink together. Craddock’s original Savoy listing didn’t include a garnish, but the dusting of nutmeg is a pleasant embellishment. The foam blocks the natural scents that would normally be present in the vermouth—something of a loss, given that the vermouth is herbal and spicy, the orgeat nutty, and good grenadine redolent of pomegranate—but it holds the grated nutmeg under your nose for the life of the cocktail. I don’t know if that’s an even trade, but it still makes for a good addition to the drink. Out of curiosity, I mixed a Pantomime without the egg white. As you would expect, the drink was much sweeter, and the flavor much more strongly driven by the vermouth. The soft subtlety of flavor and the lush richness of texture were gone, and what remained was uninteresting, nowhere near desirable as a straight serving of good vermouth. My advice? Even though it’s sort of messy to work with, always add the egg white. 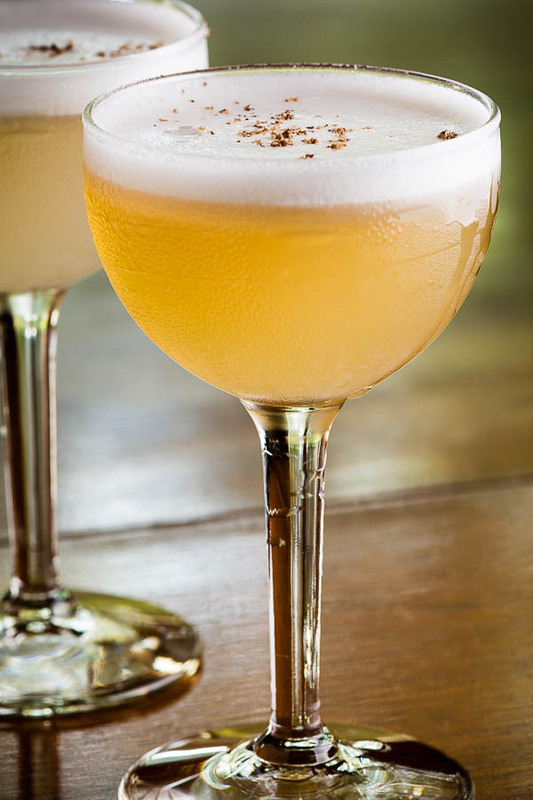 So there you have the Pantomime Cocktail—herbal, fruity, slightly sweet, very subtle, and lusciously textured. And it’s the only cocktail I know of that uses ingredients entirely from the refrigerator. If the Pantomime appeals to you, or you’re interested in learning more about vermouth and its history, check out Adam Ford’s Vermouth (2015). It’s a survey of vermouth’s ancestry and history, including its fall and rise, and American producers’ attempts to revive and restyle the spirit for the twenty-first century. And of course, there are lots more recipes. “The Rise of Vermouth and the Pantomime Cocktail” at cold-glass.com : All text and photos © 2015 Douglas M. Ford. All rights reserved. Thanks. Yes, vermouth cocktails make a great way to stretch out an evening. I have yet to try a good vermouth. This recipe seems like a good reason to go looking for a good bottle. Yes, it certainly is. Don’t forget to store your vermouth in the refrigerator after it’s open. Enjoy!